Ramadan drummers again for the last time last night as Ramadan finishes this evening. Rather poor playing we thought. Perhaps it was the time of day. We saw the drummer again in the evening – single drummer, single drum played with two sticks – one heavy for the bass beats and one light for the tattoo. We’d been led to expect quite a party to mark the end of fasting but things are pretty low-key here this evening. We swam in the Dardenelles this morning (not Hellespont – it’s no body’s business but the Turks). It was a beautiful bright morning with very clear water marred by litter washed ashore. We chose to see the PET bottles as modern-day amphorae. Rosalie went to the local market just like the others -they seem to be following us. Perhaps they’re the same stall owners. We booked for the ‘standard’ battlefields tour (turned out to be the two of us with a packed lucnh and a local taxi driver, Anil). 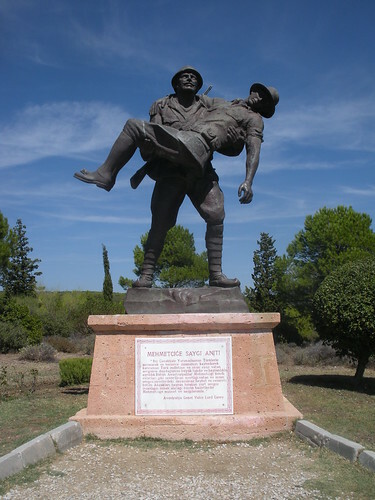 Since we’re Australian ‘standard’ means Anzac Cove, ANZAC Ceremony Site, the Nek, Schrapnel Gully, Lone Pine, Brighton Beach culminating in a visit to Mustafa Kemal’s HQ and the museum which is about to be demolished. Anil corrected my references to Mustafa Kemal as Ataturk – that being MK’s assumed surname and surnames being one of the modernisations that he brought in once he was leading the country. Anil did a good job – all the sobering statistics down pat with a very spirited delivery. It seems Turks and ANZACS share a common dislike for the major powers (esp England). The expressions of respect and goodwill towards the ANZACS are consistent and heart-felt. Anil photographed us in front of many of the infamous sites. No mention of Simpson and his Donkey or some of the other stories we know so well (cricket matches to cover retreat etc) but the Turks have there own set of battlefield heroism stories including an un-named Turkish soldier who, under a hastily raised white flag rescued a wounded digger and returned him to the ANZAC trenches. A story only brought to light by Richard Casey (later to Australian Governor-General). We asked to see one of the Turkish cemeteries (100% Islamic) – not sure whether that’s usually on the program for Aussies as the tours seem to be fairly segregated. A lot of inscriptions about patriotic martyrdom- ‘Dulce et decorum est pro patria mori’ has no hint of sarcasm for the Turks. One inscriptions was to the effect that fallen wished to return to Earth to be martyred again! The Aegean Sea was gloriously blue and crystal clear. and it was a beautiful, calm, clear, sunny day much at odds with the dreadful events that occurred there almost a century ago. 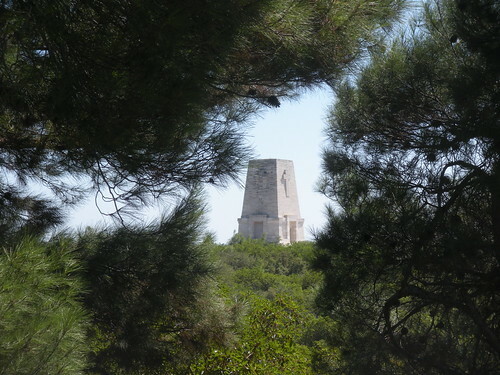 Anzac Cove is surprisingly tiny (barely an indentation) in the steep coastal escarpment – a hopeless place to try and land anything let alone an army under fire from the many perfect vantage points on the ridges above. How the ANZACS made any headway is astounding. The remains of the trenches are clearly visible separated by only metres of no-man’s land in many places. I picked up what turned out to be a molar tooth in one of the trenches and promptly put it back when I realised what it was. This entry was posted on 8 September 2010 at 6:25 pm and is filed under Turkey. You can follow any responses to this entry through the RSS 2.0 feed. You can leave a response, or trackback from your own site.